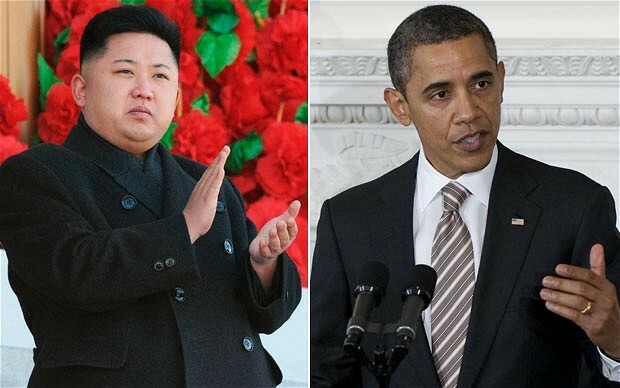 Obama sentences thousands of Koreans to die of starvation for...some reason. Claiming that North Korea had broken previous agreements made with the United States, the Obama administration announced in late march that it would be cancelling plans to supply North Korean children and pregnant mothers with food aid. Mercy Corps’ North Korean Program Director David Austin lamented the announcement and told Aljazeera that orphans at their centers were currently receiving as little as 60 percent of their normal food rations. The UN currently estimates that around 3 million people in North Korea could go hungry due to inadequate food supplies. On April 14th the rocket was launched. It was soon discovered that the rocket had in fact disintegrated in mid flight and that the launch was a complete failure. However, the Obama administration was unperturbed and confirmed that the U.S. was still going through with its decision to cut off food aid. Considering that Obama was most likely sentencing a few thousand people to death by starvation it seems highly inappropriate that Obama added as a humorous aside that North Korea has, "been trying to launch missiles like this for over a decade now and they don't seem to be real good at it". Unsurprisingly, it was accepted as fact universally in the corporate media that this had been the failed test of a ballistic missile. I have seen no evidence provided by any news source that this is actually the case. Furthermore, discussed nowhere in the corporate media is the history of U.S. provocations against North Korea. Just two years earlier, on July 25th, 2010, the U.S. and South Korea launched Operation Invincible Spirit a massive military training exercise involving 8,000 U.S. and South Korean troops, 200 aircraft and 20 ships. Invincible Spirit took place right in the Sea of Japan. This is like if Cuba launched massive military training exercises in conjunction with the Venezuelan military right in the Gulf of Mexico. To claim that the failed test of some rocket that disintegrated in mid flight constitutes enough of a provocation to threaten what Hilary Clinton calls “appropriate action” and the cutting off of food aid to starving children should raise at least a few eyebrows. Also missing from this narrative is the fact that the U.S. is partially to blame for some of the economic woes in North Korea. The U.S. has implemented sanctions against the country for 60 years, forcing the international community partially on board by the 1990s. It is likely that North Korea never even was fully able to rebuild their agricultural sector following the absolute devastation wrought upon it by the U.S. Air Force during the Korean War. Of course the tyrannical rule of Kim Jung-Il and now Kim Jung-Un bears the majority of the blame for the current food crisis in North Korea, but depriving orphans and pregnant mothers of food aid will not destabilize the North Korean government. Furthermore, this whole episode bears an eerie resemblance to the U.S. led sanctions regime imposed on Iraq in the 1990s. UNICEF estimates that those sanctions led to the deaths of 500,000 children. Not only did the sanctions regime kill 500,000 children, but also strengthened the grip of Saddam Hussein much like the current sanctions regime is strengthening the North Korean leadership. The tyrannical rule of Kim Jung-Il and now Kim Jung-Un bears the majority of the blame for the current food crisis in North Korea, but depriving orphans and pregnant mothers of food aid will not destabilize the North Korean government. Hey, this is a good article, thanks for posting. This kind of thing would be good in our blog section. If you think you might write articles again in the future we could set you up with the blog now and move this into it? Haha, I was just thinking about doing some bloggin, I used to write for the IWW newspaper and I'm getting the urge to do this kinda thing more often. Can you set me up? Done. To post new entries just click submit content - blog entry. And to fill in your blogs about section, just click my account - edit, then fill in the blog field.